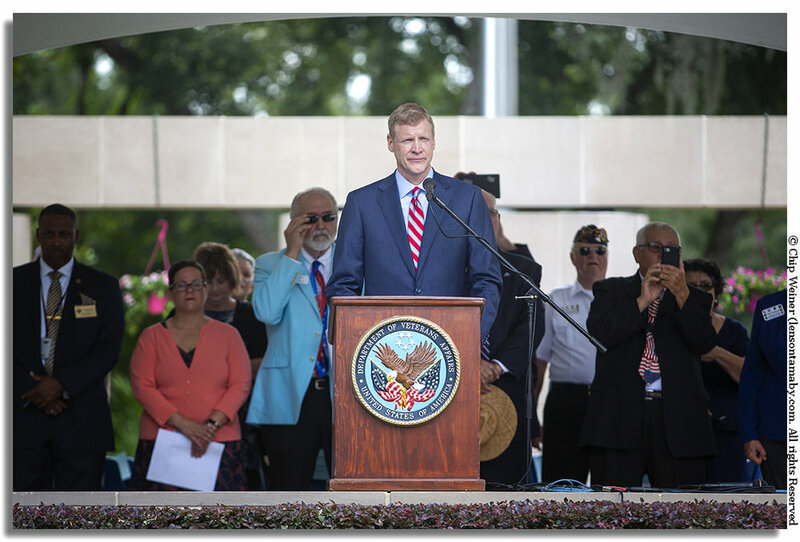 The Florida National Cemetery honored veterans on Memorial Day June 28, 2018 with a remembrance ceremony, twenty one gun salute, and an American Flag on every one of the thousands of graves, placed there by volunteers. A man wearing an Amvet uniform holds two American flags during the ceremony. The day before the event volunteers placed thousands of flags on each grave , reading the name of each veteran. Many families spend time on Memorial Day dressing the grave of their fallen member like Cody Clark Grater who died in Iraq in 1987. His family tells the story of how he died taking shrapnel for his fellow soldier knowing his comrade was expecting a baby when he got home. Every grave has a similar story and an impacted family. Putting a face with a fallen soldier helps to know who he was. The day made me appreciate the service of our military even more than I already do. It's so easy to forget the millions of soldiers who have died fighting for what they believe around the world. Do yourself and your kids a favor. Next Memorial Day or Veterans Day, take them to visit the Florida National Cemetery and show them what sacrifice looks like. Or, don't wait until then. It's open all the time. Maybe it could help us all stop bellyaching about cell phones, or Facebook, or politics... by just remembering what it takes to keep that freedom. Call a veteran today and thank them!